Installed 29 Jun 2007. Latest Update 25 Mar 2019. Changes or additions are in bold. 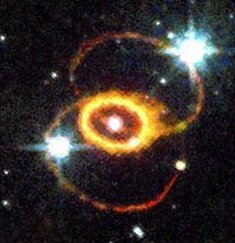 The star responsible for SN 1987a is thought to be located in the Large Magellanic Cloud (163,000 LY distant). The fact that the rings of the Triple-Ring Nebula have different centers may be explained by their source being a member of a multiple star system (most likely a triplet), and as such it has been moving in it's orbit to furnish new loci for the sequence of expanding rings. In a nutshell, the Ritz/de Sitter arrival time modulation can cause a large percentage of the starlight which has been normally emitted during a sizable fraction of the orbit period (This would correspond to the arc near perihelion that bounds the extended shaded wedge in the diagram.) to be compressed in a few tens of seconds. That time compression produces extremely high frequencies and energies. The semi-spherical shock wave is produced when the exiting particles collide with atoms in the gas surrounding the the zone of nuclear photodissociation. The zone centroid will be on the line-of-sight between the progenitor and us as observers. Distance wise, it should be located on the order of a fraction to a few light seconds from the progenitor and the border of its cross-section should be elliptical. An event related to the diffuse nuclear explosion mentioned above may have occurred in our solar system on May 10-11, 1999. In that event the gamma radiation would have been supplied by a Gamma-Ray Burst. See the article GRB 990510 and a Solar Wind Problem and the poster GRB 990510.